Juicing for pregnancy will give your body the extra vitamins and minerals it needs at this special time. Over the years, there has been a lot of talk about juicing and pregnancy. Does it really help the baby to be born healthier?Does it really make a big difference? Juicing in general has been proven time and time again to offer wonderful health benefits for the people who regularly do it. Therefore, it only makes sense that juicing for pregnancy is a great idea for the mother and the baby. A pregnant woman only has one chance to feed her baby while it is inside of her body. The worst thing she can do is eat junky, fatty foods while she is pregnant because all of those empty non-nutrients are passed on to the baby. On the other hand, if she is juicing regularly, her baby is getting vitamins, nutrients and other minerals straight from food sources. Although a woman should take pre-natal vitamins too, there is no substitute for what Mother Nature creates in the form of fruits and vegetables. A balanced diet during pregnancy is vital for the development of the fetus. These early nutrients help the baby have normal brain development as well as a better chance for a good birth weight. Juicing for pregnancy can also assist a woman with avoiding morning sickness, fatigue, constipating and anemia. By juicing higher fiber foods, a woman can keep her digestion regular during pregnancy which is often a problem. By avoiding simple sugars and white foods, she can also prevent blood sugar swings which are not good for her or the baby. The recommendation for pregnant women who want to try juicing is drinking at least 2 raw fruits and 3 raw veggies each day. One of your fruits should be high in vitamin C, such as an orange. Eating so many fruits and vegetables in one day would be very difficult which is why juicing makes it a much easier task. 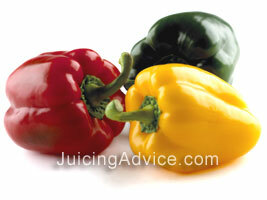 Make sure that you focus on a wide variety of colors when you are deciding what to juice. We are meant to eat vegetables and fruits from every color of the rainbow, so pick greens, yellows, reds and oranges. These will help your baby develop healthy eyes, skin and bones. They will provide B vitamins, folic acid and calcium as well. 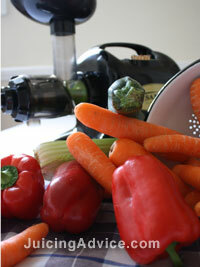 Juicing for pregnancy is full of benefits and really has no drawbacks. Plus, it might just help your baby to develop a taste for nutritious foods!